The Keck and the VLT observatories both use Ritchey-Chretien (RC) design telescopes. While SkySlab is no Keck or VLT, for astrophotography the GSO RC12-A will produce good quality pictures. 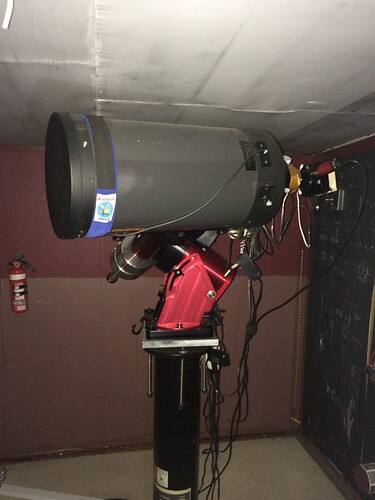 It’s a large aperture light telescope used by a high percentage of the amateur astrophotography population. One has been sourced for SkySlab from Bintel in Sydney, who shipped it safely and with great care. The 12” f/8 RC Optical Tube Assembly from GSO can illuminate an approximate 30 mm field diameter (60 mm with the optional RC corrector). And because this is a true Ritchey, you do not have to worry about chromatic aberrations, coma, false color, or the need to add a field flattener/corrector to the mix! Ritchey-Chretien telescopes do not use any lenses in their design. Instead, they consist of a concave hyperbolic primary and a convex hyperbolic secondary mirror. This design provides superb image correction across the entire field as well as very sharp images on-axis. Optical testing is done several times throughout the manufacturing process, and then before the optical set is mounted in an OTA, it is tested again and hand-corrected if necessary to bring it up the advertised wave front. The GSO 12” RC has a 1/12th wave or better primary mirror. The mirror is made of quartz and then topped with a highly reflective (99%) dielectric coating that also protects the optics against sleeks and scratches. Quartz is famous for its super low thermic expansion properties, and you will notice the difference when your telescope is exposed to the cool night air. The primary is mounted in a fixed mirror cell, eliminating the problem of image shift. The secondary mirror is also created out of the same materials as the primary (that is not always the case!) 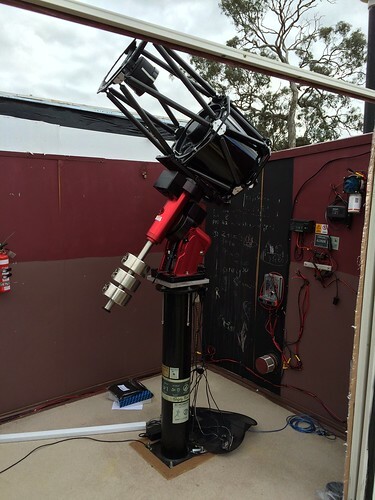 and is mounted in a fully adjustable cell for ease of collimation. Carbon fiber has an amazing strength to weight ratio, and it cools down like a champ. The 12” f/8 OTA is made of carbon truss tubes, giving the optical tube a weight of only 44 pounds. The inside of the optical tube includes a computer-optimized baffle system to eliminate stray light. Three small fans located at the back of the telescope help it reach ambient temperature in a flash. The GSO 12” RC comes with a 3” Crayford Focuser. The focuser rides on a stainless steel track, or monorail when you rack the focus in or out. This updated design feature keeps the focuser from twisting or bending when you have a camera or imaging set-up riding on it. A 10:1 dual speed focusing system allows for both coarse and fine focus, and the focuser can be rotated 360º to help you achieve the proper image orientation.